Original Article: "Aba Opens in Chicago’s Fulton Market"
Top Chef Duel‘s winner chef CJ Jacobson has launched a new Mediterranean concept in Chicago’s Fulton Market with Aba, which means father in Hebrew. 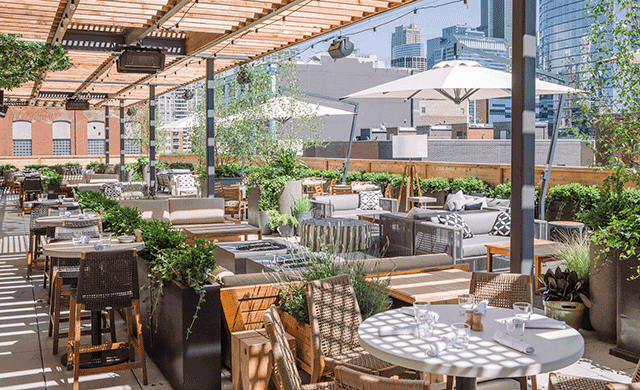 The rooftop is crafted by senior project design Avril Zavas, who led the Lettuce Entertain You in-house team of Sarah Noncek, Meghan McLaren, and John Cinelli. The open dining room boasts lush greenery, including climbing ivy as well as potted plants and trees beneath a large skylight. The spacious patio features lounge-style and dining seating to host an array of guests. In addition to the 10-seat chef’s table, the restaurant is anchored by firepits as well as the indoor-outdoor bar. The space can also be reconfigured to accommodate private and semiprivate dining.